The city of Grafton is the seat of Local Government, the Federal and State Government administrative centre, and the commercial hub of the Clarence River Valley. Established in 1851, Grafton features many historic buildings and tree-lined streets. It is located approximately 630 kilometres north of the New South Wales State capital, Sydney, 340 km south of Brisbane, Queensland and approximately 35 km west of the Tasman Sea coast. As at June 2015, Grafton had a population of 18,689. Before European settlement, the Clarence River marked the border between the Bundjalung and Gumbaynggirr peoples, and so descendants of both language groups can now be found in the Grafton region. Grafton, like many other settlements in the area, was first opened up to white settlement by the cedar-getters. An escaped convict, Richard Craig, discovered the district in 1831. With the wealth of 'red gold' cedar just waiting for exploitation, he was given a pardon and one hundred pounds to bring a party of cedar-getters on the cutter 'Prince George' to the region. Word of such wealth to be had did not take long to spread and one of the arrivals was pioneer John Small on the 'Susan' in 1838, and he first occupied land on Woodford Island. 'The Settlement' (as the embryonic Grafton was then imaginatively named) was established shortly after. Grafton has a humid subtropical climate with significantly more rainfall and higher temperatures in summer than in winter. Rainfall is lower than in stations directly on the coast, but monthly rain totals can often surpass 300 millimetres (12 in). The wettest month since records began was March 1974 when Cyclone Zoe produced a monthly total of 549.0 millimetres (21.61 in), whilst during periods of anticyclonic control and strong westerly winds monthly rainfall can be very low; for instance in July 1972 only 0.3 millimetres (0.01 in) fell. Grafton gets around 115.2 clear days on an annual basis. Grafton like many NSW regional centres, is affected by heatwaves in the summer months. On 12 February 2017 Grafton recorded a maximum temperature of 46.3, the town's highest recorded temperature since records began. Grafton is known and promoted as the Jacaranda City, in reference to its tree-lined streets and to the annual Jacaranda Festival. Inaugurated in 1935, Jacaranda is held each October/November. A half-day public holiday is observed locally on the first Thursday of November, the Festival's focal day. A half-day public holiday is also observed for the Grafton Cup horse race, held each year on the second Thursday in July. It is the high point of the city's annual Racing Carnival—Australia's largest and richest non-metropolitan Carnival—which takes place over a fortnight in that month. Grafton is the birthplace of several renowned country music players. Local artist Troy Cassar-Daley received four Golden Guitar awards at the 2006 Tamworth Country Music Awards—the largest and most prestigious country music awards in Australia. At the same event Samantha McClymont, the 2005/2006 Grafton Jacaranda Queen and sister of Brooke McClymont, also received an award for her country music talent. A vision of Grafton with its numerous brilliantly-flowered trees in bloom is immortalised in Australian popular music in Cold Chisel's song Flame Trees, written by band member Don Walker, who had lived in Grafton during his formative years. Christ Church Cathedral, designed by John Horbury Hunt, was consecrated in 1884 and is the seat of the Anglican Diocese of Grafton. Schaeffer House is a historic 1900 Federation house and contains the collection of the Clarence River Historical Society, which was formed in 1931. The Murwillumbah – Byron Bay – Lismore railway (opened in 1894) was extended to Grafton's original railway station in 1905; for details, see Murwillumbah railway line. The North Coast Line reached South Grafton's railway station from Sydney in 1915. 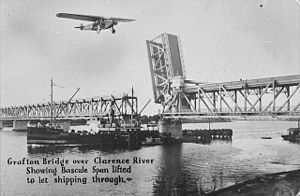 Pending the opening of the combined road and rail bascule bridge in 1932, Grafton had a train ferry to connect the two railways. Clarence Valley Regional Airport is the airport that services Grafton. Grafton also lies on the Pacific Highway, the main North–South road route through Eastern Australia, and links it to the Gwydir Highway, one of the primary East-West routes through Eastern Australia. Busways Grafton is the operator for local town routes, as well as out of town routes to Junction Hill, Jackadgery/Cangai, Copmanhurst, and Maclean and Yamba. Lawrence Bus Service operates a shopper service, as well as school service on school days, to and from Lawrence. Northern Rivers Buslines operates a weekday service to Lismore via Maclean, Evans Head and Coraki. NSW Trainlink provides a Coach service to Byron Bay, connecting off the train from Sydney. It also offers a Coach service to Moree via Glen Innes, connecting from the train from Brisbane. During World War 2, Grafton was the location of RAAF No.6 Inland Aircraft Fuel Depot (IAFD), completed in 1942 and closed on 29 August 1944. Usually consisting of 4 tanks, 31 fuel depots were built across Australia for the storage and supply of aircraft fuel for the RAAF and the US Army Air Forces at a total cost of £900,000 ($1,800,000). Grafton, New South Wales Facts for Kids. Kiddle Encyclopedia.